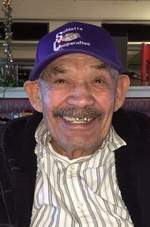 Arturo Santiago “Art” Cepeda, 86, died surrounded by his family on Saturday, March 16, 2019 at Sublette, Kansas. He was born July 25, 1932 to Maria Luna and Florentino Cepeda in San Salvador, Mexico. He married Aurelia Alonzo on February 15 1969. She passed away on October 28, 2006. In the 1970’s, Art moved his family to Sublette to work for Ed Hall. He spent many hours planting and watering crops and caring for cattle. He enjoyed spending time with his family. Art would encourage friends and neighbors with God’s Word. He served as Pastor for the Hispanic congregation at the Sublette Church of Christ. In recent years he enjoyed riding his three-wheeled bike around town. He often greeted people with a big wave and smile. He loved music and dancing with his grandchildren. He is survived by his son, Florentino “Coco” Cepeda and wife Maria of Sublette; daughters, Rosa Young of Liberal, Gloria Galaviz of Sublette, Maria Melendez of Liberal; 14 grandchildren and 21 great grandchildren. He is preceded in death by his wife Aurelia Cepeda. Visitation will be 2:00 until 7:00pm on Tuesday, March 19, 2019 at Weeks Family Funeral Home & Crematory. Funeral service will be 2:00pm Wednesday, March 20, 2019 at the Sublette Southern Baptist Church with Pastor Tim Tidenberg officiating. Interment will be at Haskell County Cemetery immediately following the service.